Thompson Aire has been providing the best hot air balloon excursions to the Orlando area for over 35 years. But what they are really offering an amazing experience you will talk about for the rest of your life. If you thought the Disney World area of Orlando was amazing before, just wait until you see it from thousands of feet up as you glide along the horizon. The following will illustrate how Thompson Aire has become the most trusted and loved hot air balloon ride company in all of Orlando. Thompson Aire is not necessarily the cheapest hot air balloon ride that you will find out there, but they definitely offer the best experience. A slight difference in pricing makes sense when you consider the other guys cram 20 people into a basket, while Thompson Aire only takes four to six people up per balloon. This provides for an intimate experience. Their balloons even have seats in them for those who do not wish to stand for an hour! These rides offer a mesmerizing mixture of peace and exhilaration that you simply cannot understand until you experience one yourself. Once you get your feet back on solid ground, the Thompson Aire team will explain some of the history of Hot Air Ballooning and celebrate with the traditional champagne toast complete with souvenir custom champagne cups. In addition you will be treated to breakfast. This is not an energy bar out of a picnic basket; either; all riders get a spot in a private dining room, where they will find a full buffet complete with an omelet station. This is the perfect end to the perfect morning! With over 38 years of hot air balloon experience, Capt. Thompson is the best option for an excursion into the sky over Orlando. Not only do he and his fellow pilots offer the safest ballooning experience possible, they offer incredible knowledge of the area over which they are navigating. 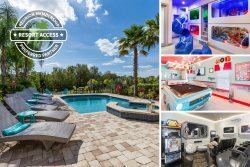 This experience guarantees that you will be able to enjoy the most amazing views that the Disney World area has to offer. One of the many things that sets Thompson Aire apart from the others is their passion and expertise in hot air balloon flight. If you are visiting Orlando for the theme parks, make sure you make time to see them from this one of a kind perspective. It is sure to provide for a memory that you will never forget. Call to make a reservation at (407) 421-9322. It is a valuable experience to both those that have lived in Orlando all their lives and for those just visiting alike. Flights are weather permitting. Choose a date near the first part of your available time so you have other days for backup just in case Mother Nature does not want to cooperate.